WARNING: CHOKING HAZARD – Small parts may be generated. Not for children under 3 years, Ages 5 and up. Jedi Knights, Sith Lords, Stormtroopers, X-Wings, Star Destroyers, AT-AT Walkers, droids, Wookiees, Rebel heroes, and more! 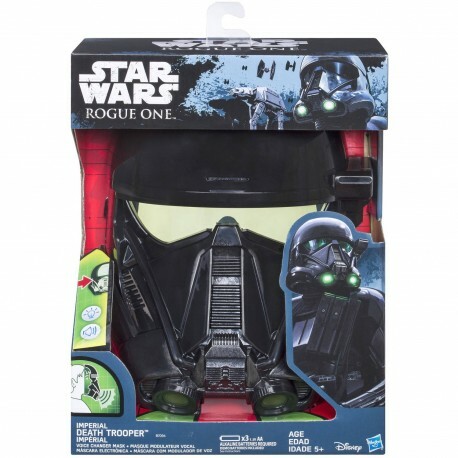 Discover the exciting stories of good versus evil in a galaxy far, far away with the Imperial Death Trooper Voice Changer Mask from Star Wars: Rogue One! Battle the Rebels as an Imperial Death Trooper with this electronic mask that transforms your voice into the elite soldiers of Imperial Intelligence when you speak! Imagine what it’s like to enforce the highest orders of the Empire behind this dark-gleamed electronic mask that’s a movie-accurate reproduction of these ominous soldiers’ armor! Anonymous and brutal, Death Troopers serve as bodyguards and enforcers for Director Krennic, a highly-placed and cunning officer within the Advanced Weapons Research division of the Empire. Put yourself straight into the middle of the action and defend the Empire with this awesome Imperial Death Trooper Voice Changer Mask from Star Wars: Rogue One, and re-create all of the moments from the Star Wars saga with this and other role play toys from Hasbro Star Wars.